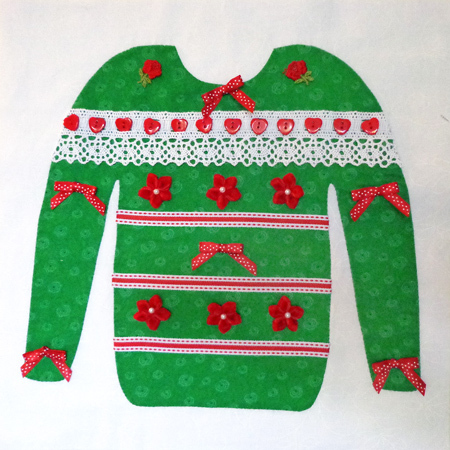 The ‘lucky” reader who won the Ugly Christmas Sweater block is… Beverly! 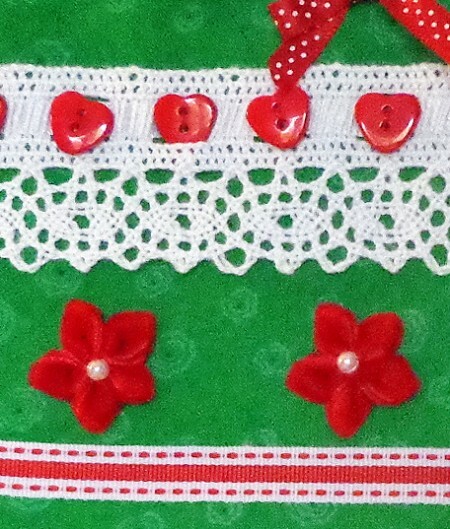 Beverly claims that she is planning a Christmas quilt that will welcome and enfold this block. Nice. I love a happy ending. 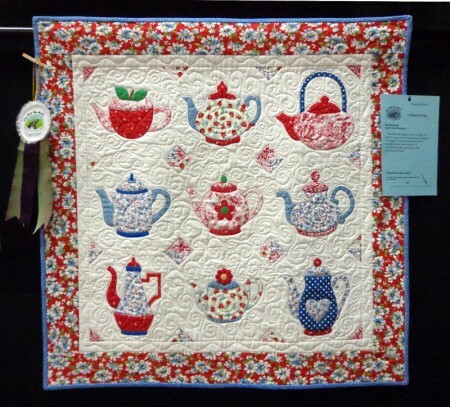 Speaking of winning, a teapot quilt that I put in my guild’s show over the weekend received a Judge’s Choice ribbon! 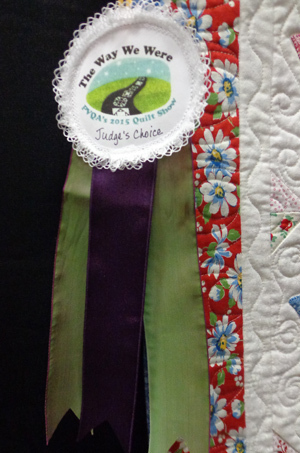 Our show is not juried or judged, but we do have visiting dignitaries come and put ribbons on their favorites. I never found out who the judge was… whoever you are, thank you so much! 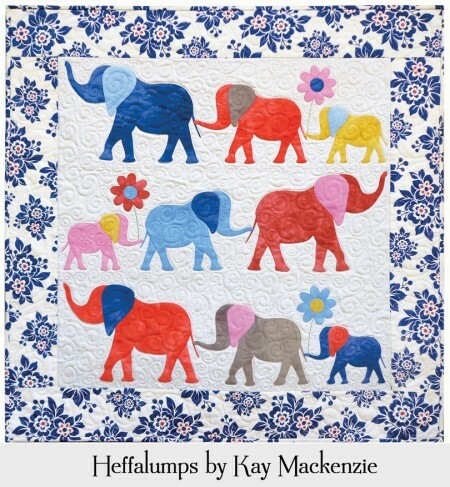 The quilt features nine of the teapots in my Teapots 2 to Appliqué, on the book page at kaymackenzie.com. Just got word that I’ll have a block in the next issue of 100 Blocks! Keeping my streak alive! However, they sent back another block and said no thank you. I sewed as much stuff to it as I could. 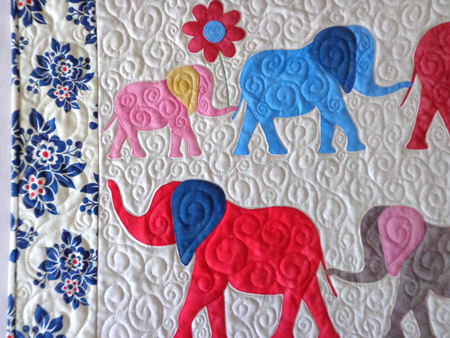 Would you like to inherit this hand-appliquéd and embellished 12″ block? if so, please leave a comment before 7:00 p.m. California time on Wednesday, February 18. U.S. shipping addresses only, and clicking “Reply” to your email feed won’t enter the drawing. Come to the blog on the internet and leave your comment at the bottom of the post. Thank you to anyone willing to adopt this poor orphan. Thanks you *so much* to everyone who left nice comments about the Heffalumps. I’m as tickled as the pink baby one. 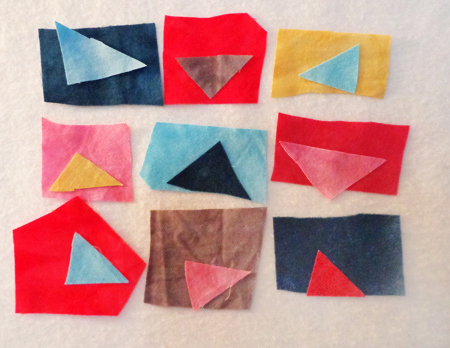 My fellow appliqué enthusiast Darcy Ashton just published a guide to the hand-stitching of eyes. It includes 14 different eyes, with instructions for all of them! 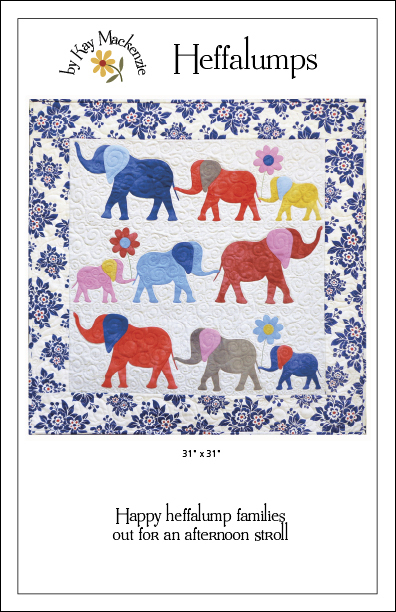 Darcy is the author of many appliqué classics featuring animals, from bunnies to big dogs to little dogs to horses to butterflies to aquatic creatures. I’ve always thought she did the most fantastic job with the eyes, really bringing the animals to life. Check out Darcy’s website Ashton Pubications, which features all of her books, and spend some time poking around her Etsy shop as well, where you’ll find many darling patterns. She also has an embroidery stitch guide.